A lady displays her artistic jewelry at a market stall at the Saturday Markets in downtown Fredericton, New Brunswick. 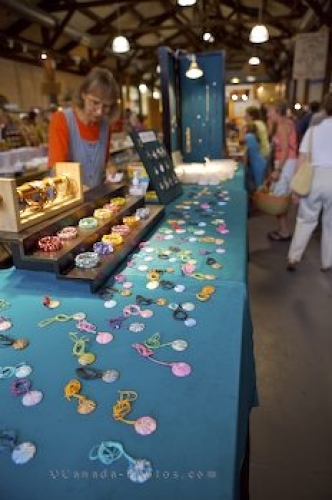 Beautiful bracelets, necklaces and earrings handcrafted by a woman with artistic skills are on exhibit at a market stall at the Saturdays Market in downtown Fredericton, New Brunswick. Jewelry of a variety of colors can be mixed and matched with different pieces and can be worn with outfits of many shades and designs. Market Stall at the Saturday Markets in downtown Fredericton, River Valley Scenic Drive, Highway 2, New Brunswick, Canada. Picture of a display of artistic jewelry at a market stall in Fredericton, New Brunswick.